Got coffee? With the Hamilton Beach 43254 Classic Stainless Coffeemaker from Today’s Concept, you can! This stylish stainless steel accented coffeemaker features a 12-cup carafe. A viewable window allows you to see exactly how much water is being poured into the maker and a programmable timer allows you to make ahead for the next day. In addition, a two hour auto shutoff feature for safety means you will never wonder whether or not you remembered to do so. For those moments of caffeine impatience, a pour and serve feature allows you to stop brewing long enough to pour yourself a cup of this precious liquid. 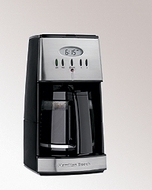 Combine function and fashion with the Hamilton Beach 12 cup Classic Stainless Steel accented coffee maker. The coffee maker has accelerated brewing and chlorine removing water filter to enhance the taste of your morning beverage.